On Sunday, March 22nd The First Baptist Church of Burlington celebrated the installation of their new pastor – Rev. Kevin Lowe. Joining the congregation to celebrate this closing moment of an over 18 month journey were representatives of local clergy, ABCNJ regional staff, and officials from the City of Burlington. The ABCNJ family was well-represented at this joyous event. Dr. Lee B. Spitzer delivered the installation sermon, and Rev. Vernl Mattson issued a charge to the candidate. Maurice Mimms, an associate pastor at Alpha Baptist Church, delivered the benediction. Rev. Lowe and his family are thrilled to be journeying with both the congregation and the wider community of Burlington City, and look for God to do wonderful things. Let us all keep this fellowship in prayer as they strive forward in the work of the Gospel! On Sunday, April 14, Rev. Scott Warren was installed as the pastor of the First Baptist Church in Mt. Holly. In addition to being celebrated by the members of First Baptist, Rev. Warren was formally welcomed by members of Mt. Holly's ministerium and the Greater Delaware Valley Association. 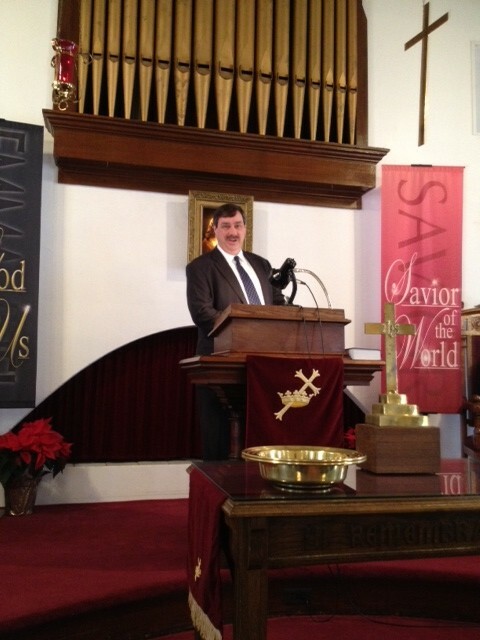 Dr. Lee B Spitzer, a member of First Baptist and Senior Regional Pastor for ABCNJ, preached a sermon encouraging Rev. Warren and the other members of First Baptist to journey together after Jesus. Perhaps the most touching moment of the service came as Rev. Warren responded to his installation charge. While recalling all the events which led he and his family to his calling, Rev. Warren paused as a sense of joy over-came him. When he uttered a brief, "Sorry," someone in the congregation called back, "That's OK, we love you!" What a wonderful way to begin a pastoral relationship! Here are highlights of the installation service.